​It is impossible to speak about the traditional music of Southeast Asia in the singular. Because of its geography, Continental and Insular Southeast Asia have always been at the crossroads of Asian, European, and American cultures, encounters of which have resulted to both internally- and externally-induced cultural changes. An awareness of the histories of these cross-cultural encounters makes us realize that traditions have not always been received from the past as if pure and fixed but have come about as varied creative responses to culture changes in particular time periods that inevitably affected those traditions. Traditional court musics of Southeast Asia, e.g., have tended to be resilient and conservative–as if timeless traditions–because its adherents have believed in their enduring music essences and have therefore maintained them as such, i.e., permanent and unchanging. But at some point in the past, that timeless tradition must have been constructed as the courts in Southeast Asia had consolidated their power. We know, e.g., that the gamelan of Central Java had roots in village communities and that it was later appropriated by the sultans of Yogyakarta and Surakarta as musical symbols of their power, i.e., as a divine manifestation in a socially constructed cosmology (as discussed for example in Judith Becker’s first book). The same is also true of Hindu-Balinese gamelan, which continues to be practised by villagers today even after the courts are gone (see Geertz). ​Yet traditional court musics of Southeast Asia cannot speak for the whole region. At the fringes of court cultures are village cultures, which, as just mentioned, were the sources from which court music traditions had evolved from. The villages and courts had interdependent cultural relationships with each other. In the villages, among the majority of the populations, there were varied forms of music making that were based on musical interlock–multipart music–as a symbol of social cooperation. For me, this interlock is a shared musical principle that governs many musical systems in the region and it would be good to investigate this closely at a later symposium. When the towns evolved into port cities, which exported the agricultural products of the country in 19th century, many European nationals established merchant houses in Manila, Cebu, and Iloilo and therefore government bureaucracy also became more complex, prompting Spanish diaspora in Philippine cities. Along with them were also European writers who wrote travelogues, which did not fail to mention the brass bands as well as local song-dance musical genres that were described to be symbols of national identity like the cundiman, kumintang, and balitao. The travelogues had music transcriptions of these popular music condiman, comintang, and balitao that became “tradition” in the course of time. The transcription of condiman comes from this 1847 album preserved in an illuminated manuscript commissioned by a Spanish journalist Gervacio Centerenolla. The second is a transcription of comintang by the French traveller Jean Baptiste Mallat in 1848 that the English journeyman John Bowring reprinted 1858. There was another book in 1860 that printed the condiman and of course one more in 1892 by Manuel Walls. ​What is fascinating with these materials is that they constructed 19th century popular music in the Philippines, which are actually limited to specific regions in the archipelago, into the national, i.e., for the whole of the Philippine archipelago. My hypothesis is that the transcriptions–writing music–did influence the status of the genres, i.e., they became elevated as a result because a value was added to them such as patriotism and the like. In the case of the kundiman, this genre lost its dance component in 20th century and became a serious type of music for voice alone. The song “Bayan Ko” sung in the 1986 People Power Revolution is a good kundiman. To look closely, this ubiquitous song-dance genre in the Philippines is not tied in to the national political for it is simply “entertainment” music in village festivities, especially during meetings between wife-givers and wife-takers. The song-dance genres I just mentioned are reminiscent of indigenous types of music still cultivated in remote parts of the Philippine Islands today. As a music that alternates song between man and woman, it is very similar to the Malay pantun or Laotian molam. But the Philippine types were fused with Western element such as lute accompaniment and harmony and are therefore hybrid or mestizaje musics. What do we learn from this? First, the examples given point to the fact that music tradition is not fixed but something that is made to appear as such as part of a political process in history. Second, we can understand tradition if we explore in depth its context, by which I mean the material conditions that enable the tradition to be fixed. In this short paper, I pointed out the technology of writing. Third, tradition is a response to present circumstances, especially the new or the modern. When the Europeans encountered local culture in the Philippines, they saw a local song-dance as a marker of a place that is different from Europe. While presumably they wrote about it as a costumbre or local custom of the place (hiding the fact that half of it is of Western origin), readers of their travelogues later used the same attention for local custom but added the sentiment of patriotism into the text. Thus, if we do not reflect on the important role that cultural context plays in the construction of tradition, then it will be difficult for us to comprehend that tradition cannot be separated from the new or the modern by which traditions had to adjust. Bowring, John. A Visit to the Philippine Islands. London: Smith, Elder & Co., 1859. Mallat de Bassilan, Jean Baptiste. Les Philippines. 2 vols., 1846. Scherzer, Karl. Reise der österreichischen Fregatte Novara um die Erde in den Jahren 1857, 1858, 1859 unter den Befehlen des Commodore B. von Wüllerstorf-Urbair. Volume 2. Vienna: Court and State Printer, 1861. 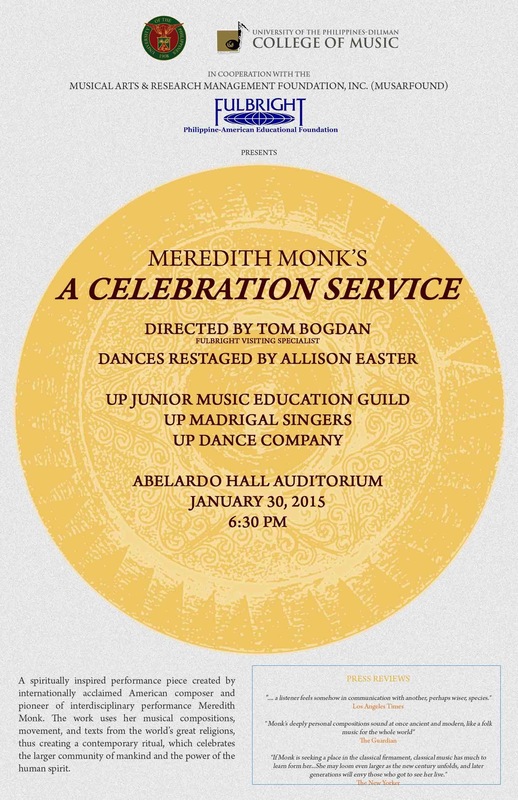 The Office of the Chancellor of the University of the Philippines (UP) Diliman and the UP College of Music, in cooperation with the Musical Arts and Research Management Foundation and the Philippine-American Educational Foundation, present a rare music ritual-concert of Meredith Monk’s A Celebration Service on Friday, 30 January 2015, 6:00 PM at the lobby of Quezon Hall (Central Administration Building of UP Diliman), Quezon City, following the flag retreat at 5PM. To be directed by Tom Bogdan of Bennington College in Vermont, USA, who is in Manila under the Fulbright Specialist Program, the work will be interpreted by the UP Madrigal Singers, UP Junior Music Education Guild, and the UP Dance Company, with Elders Ramon Acoymo and Daisy Valenciano and singers Mark Carpio, Camille Bianca Lopez, Riva Ferrer, Terrence, and Tom Virtucio. Allison Easter, another protege of Meredith Monk, will choreograph the show. As a composer, Monk is considered an extraordinary visionary in the field contemporary art music in the USA today and the premiere of her piece in the Philippines is a momentous event for the UP College of Music, which is celebrating its 99th year. The performance also kicks off the Arts Month of UP Diliman campus. A Celebration Service is a participative ritual performance that goes beyond passive listening and spectatorship for it fosters a profound musical contemplation on the human experience of connectedness and relationality with various Others in the world–with nature and with the Ineffable. Monk’s work is minimalist, abstract, open-ended, processual, transcendental in terms of time, simple but holistic, mysterious, and it illuminates relationships of presence that ritual is in essence. While songs in this piece are mostly made up of vocables, the mostly ancient texts–to be spoken by ritualist Elders–come from world spiritual traditions. For this performance in the University of the Philippines Diliman, these texts will be recited in Filipino, as translated by poet Pete Lacaba. 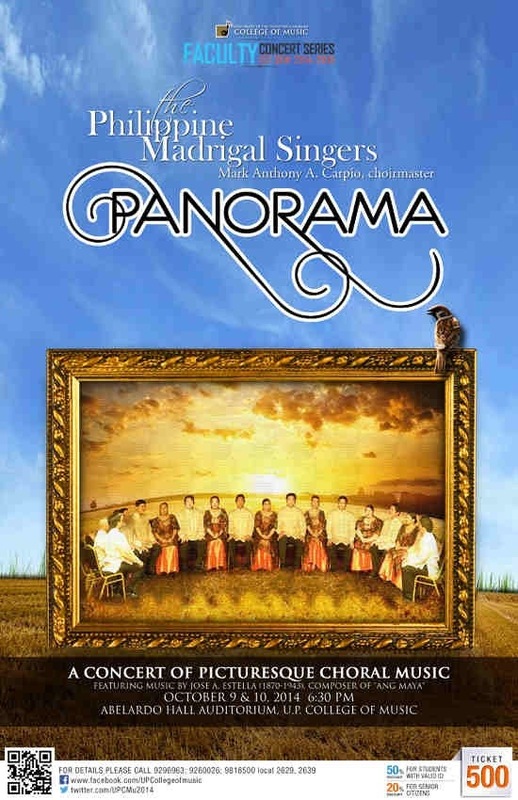 Music lovers in Manila will have a rare opportunity to listen to José A. Estella’s other “Ang Maya” songs that have been specially arranged by Chris Borela for the UP Madrigal Singers concerts on 9 and 10 October, 2014, 6:30PM, Abelardo Hall Auditorium, Quezon City. Dubbed “Panorama,” the concerts on the theme of picturesque music will be directed by Mark Carpio, as part of the College’s on-going faculty concert series. Mark Carpio is one of the best choral directors the Philippines has ever known. José A. Estella (1870-1943) was a Spanish insular, a creollo, a Filipino composer who was not a mere gig musician who composed waltzes but an important public intellectual who filipinized Spanish zarzuelas from 1890s to 1900s and a nationalist artist who asserted the beauty of Philippine folk songs and dances in his large works such as Cancionero Filipino, Filipinas Symphony (1928), the first symphony written by a Filipino, Ultimo Adios (symphonic ode), and the opera Lakambini (Maiden). These works are all preserved in a collection that Estella’s granddaughter, Mrs. Mariles Teotico had donated to UP Music Library in April 2014. The scope of preserved music manuscripts and prints in the Estella collection is unique for it chronicles a wide time period (late 1880s to 1938), the cultural history of which is yet to be written. Practically all of José Estella’s music creations–arrangements, transcriptions, and original compositions based on Cebuano balitaw, Hiligaynon Lulay, Tagalog auit and condiman, Waray Curacha–are intact in this collection having been safeguarded from the many wars (1896 revolution, 1898 Filipino-American war, and 1945 Liberation of Manila from the Japanese) that were a prelude to the first Philippine Republic in 1946. 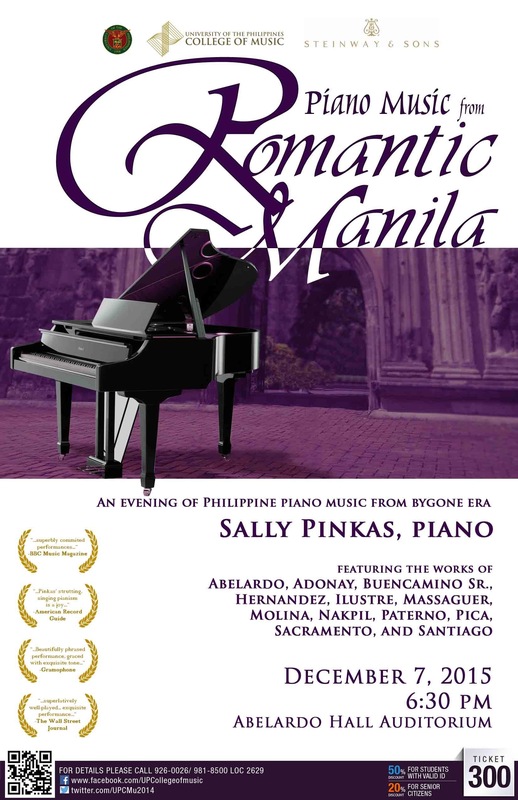 The “Ang Maya” waltz was a piece in Estella’s 1905 sarsuwela–with Severino Reyes as librettist– Filipinas para los Filipinos, which critiqued the racist bill forbidding Filipino men to marry American women, a double-standard in colonial policy. “Maya” is rice bird, a typical object in Philippine landscape. Estella consciously represented the everyday life of common tao in the Philippines, thus predating some works by composers who graduated from UP Conservatory of Music in 1920s. Tickets are at 500 pesos each, with discounts to students and senior citizens. 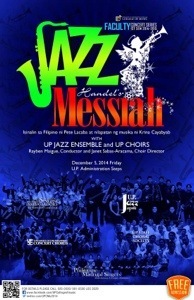 For details, please contact the UP College of Music (02) 926.0026. 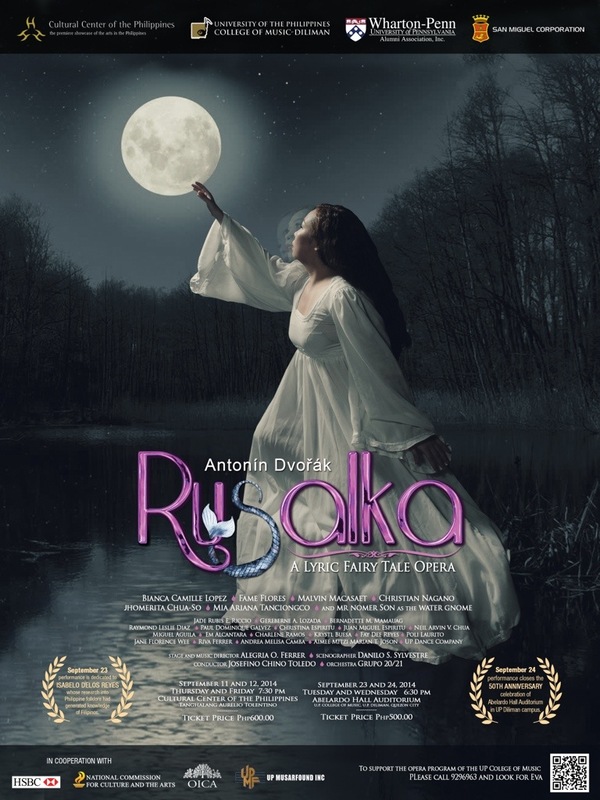 The University of the Philippines College of Music will bring to life Antonin Dvorak’s heart-rending lyric fairy tale opera Rusalka on 11 and 12 September, 7:30pm at the Cultural Center of the Philippines Little Theater, Pasay City, and on 23 and 24 September, 6:30pm at the Abelardo Hall Auditorium, Quezon City. The show is directed by Alegria Ferrer with chamber orchestra to be conducted by Josefino Toledo and with sets and lighting design by Dan Silvestre and David Ohm, respectively. In the cast are brilliant young Filipino sopranos Fame Flores and Bianca Camille Lopez, who will alternate in characterizing the difficult main role of a water sprite (serena) named Rusalka who aspires to love a human being but, in the process, was rejected and who, therefore, learnt the hazards of loving a fleshly creature that a human being is. A full premiere of the work in the Philippines, UP’s Rusalka will be adapted to a Filipino setting, particularly to the time of Isabelo de los Reyes (1864-1938), whose contribution to knowledge of Philippine folklore is pioneering. An ilustrado intellectual of late 19th to early 20th centuries, de los Reyes documented narratives of living Philippine folk beliefs and practices of his time in order to build an archive of Philippine culture so as to understand the uniqueness of Philippine society in relation to universal truth and science. The love that Rusalka learns in dealing with a human being in this fairy tale opera, though originating far from the Philippines, is one such truth and Isabelo de los Reyes would have easily understood its universal message. 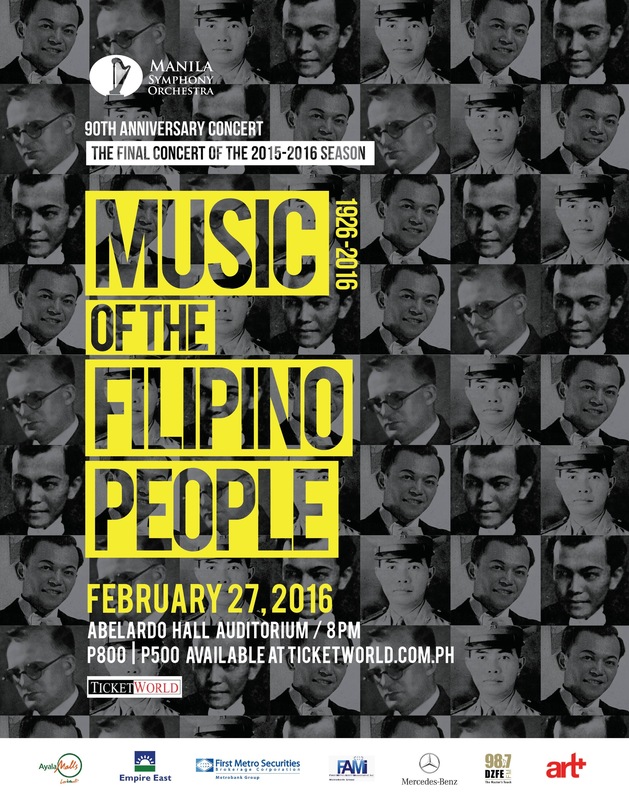 As a homage to him being a cosmopolitan Filipino nationalist who is celebrating his 150th birth centenary this year, UP College of Music juxtaposes, without translating, the original music of this opera that will be sung in English with characters whose names are familiar to Filipinos such as the spirits of the environment like diwata, hukluban, serena, nuno ng lawa, etc.